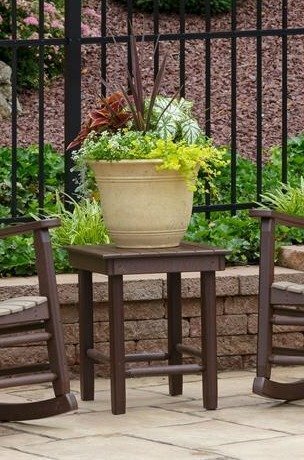 Outdoor accent tables are essential for relaxing. The Amish Zinn's Mill Poly Side Table is ready to catch your reading material, phone, tablet drink and sunglasses and keep them handy nearby. This handy table is made with poly lumber that won't fade, rot, crack or splinter--making it the ideal material for outdoor furniture that will last. Enjoy every minute of your time outside with poly outdoor furniture that requires very little maintenance--just an occasional washing with soap and water. Order today to start building your dream collection of outdoor furniture. *Our Zinn's Mill Accent Tables ship fully assembled and ready for use.